It is in a crisis that the true colors of people rise to the surface. In the case of a snowstorm last week, I benefited from the strength of three quiet leaders when it really mattered. The weather forecast wasn’t great last Saturday, but I made it to LaGuardia airport in NYC without incident. 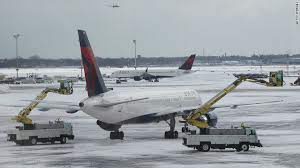 As I settled into the Delta Skyclub the snow fell harder and the dreaded red canceled signs on the screen started appearing. I waited in line with the other passengers and managed to secure a standby seat on the one remaining flight headed back to Atlanta. The delay seemed to last forever, but miraculously the flight was not canceled and 6 hours later several of us headed down to the gate. My first quiet hero was an off-duty flight attendant who volunteered to join the assigned crew so that the plane could comply with the FAA and be able to take off. She changed into her uniform and waited 2 hours for her clearance. Then she stepped into character, switching from a weary passenger to a focused, working flight attendant. When I boarded the plane and thanked her she looked slightly embarrassed. “Of course!” she said and continued helping passengers on the crowded flight with their bags. After we landed late that evening, I ran to a taxi at the curb. Atlanta was emerging from an ice storm and I knew driving could be treacherous. My cab driver navigated the road safely. He exhibited calm and made low-key conversation so the time flew by. I trusted him to get me safely home and he did. When I thanked him he just smiled. It was 2:30 a.m. when the garage door finally opened and the man who I have known most of my life stepped onto the ice to help me out of the cab. I was so happy and touched that husband Bill actually waited up for me. He showed up and that meant everything. The actions of quiet leaders speak so much louder than words ever can. Without fanfare, they deliver when it counts. This entry was posted in Uncategorized on January 11, 2017 by Jennifer Kahnweiler. Wow! That was quite an adventure. I am glad you made it home safely.